Madison East High Auditorium Renovation campaign may get boost! The Wisconsin State Journal recently reported on a new program to match public funds with private donations for projects like the “Raise the Curtain” fundraising campaign to renovate the East High auditorium. We’ve been grateful to East High for allowing us to use the auditorium for our programs by John Olson and Dave Martinson on East High athletics in May 2010 and 2011. But we have to share the opinion of the acoustics and seating expressed in the WSJ article. “The auditorium remains an ugly, acoustically dysfunctional lecture hall full of uncomfortable burnt orange bowling alley chairs,” wrote Matthew DeFour. The organizers of the “Raise the Curtain” campaign had hoped to find $3.5 million dollars by this year, in honor of East High’s 90th anniversary in 2012. 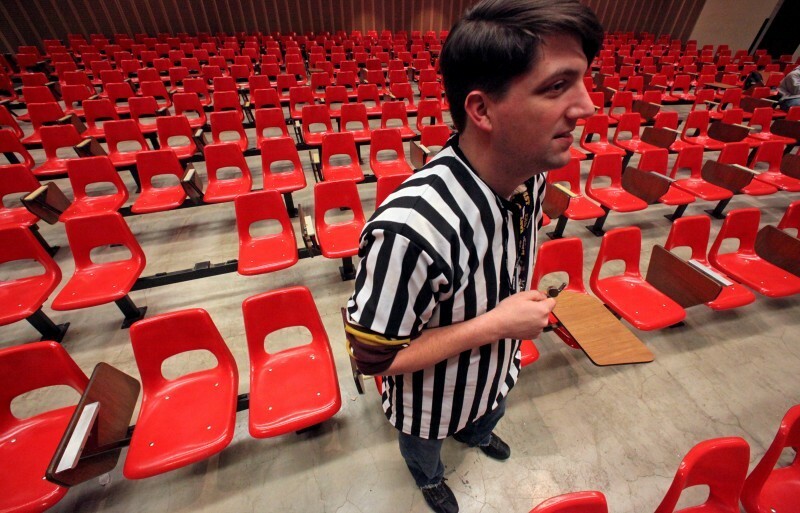 Photo by CRAIG SCHREINER – State Journal Paul Milisch, East High drama director, teaches a class Thursday in the auditorium, which currently features bowling alley chairs bolted to a concrete floor. Originally formed as the “Eastside Advancement Association” in 1912, the club changed its name to “ The East Side Businessmen’s Association” in 1923 and in 2006 to “The East Side Club.” If you’ve shopped or banked or attended school on the East Side, or enjoyed the shade trees and sports fields, or attended local festivals, you’ve benefited from the club’s good work. 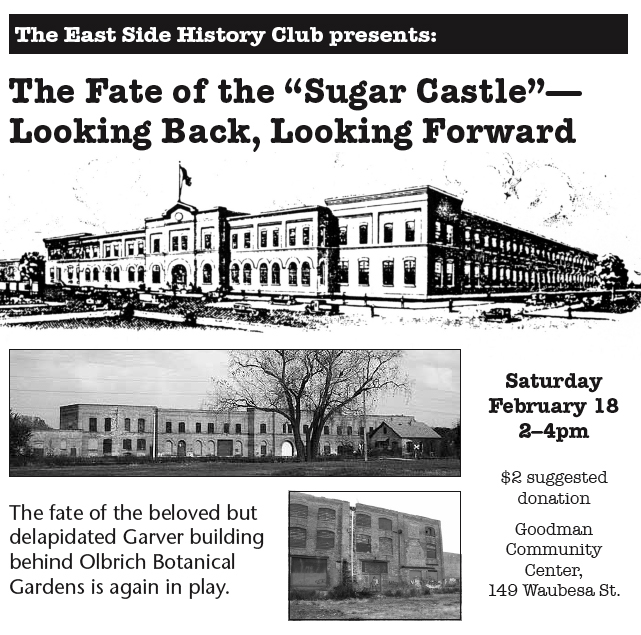 Bring your stories of the East Side Club to share at our February meeting. Special Meeting Location! 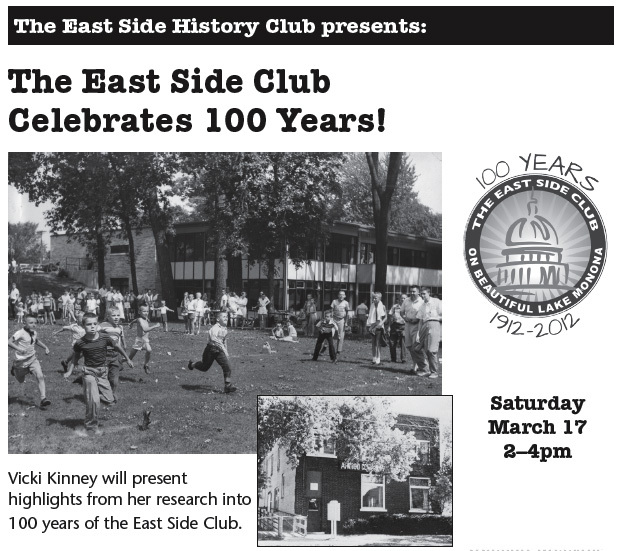 East Side Club 3735 Monona Dr.
Saturday March 17 from 2–4pm. $2 suggested donation.